Want some ideas for that fabulous textured hand spun yarn you just purchased? Have you been saving some of your own amazing handspun for just the right project but not sure what to use it for? No worries. We provide some solutions and inspiration in these two books. Find patterns, stitches, combinations, knitting with locks, inspirations for weaving and lots more. Simple easy knit and crochet projects, with ideas to make them your own. 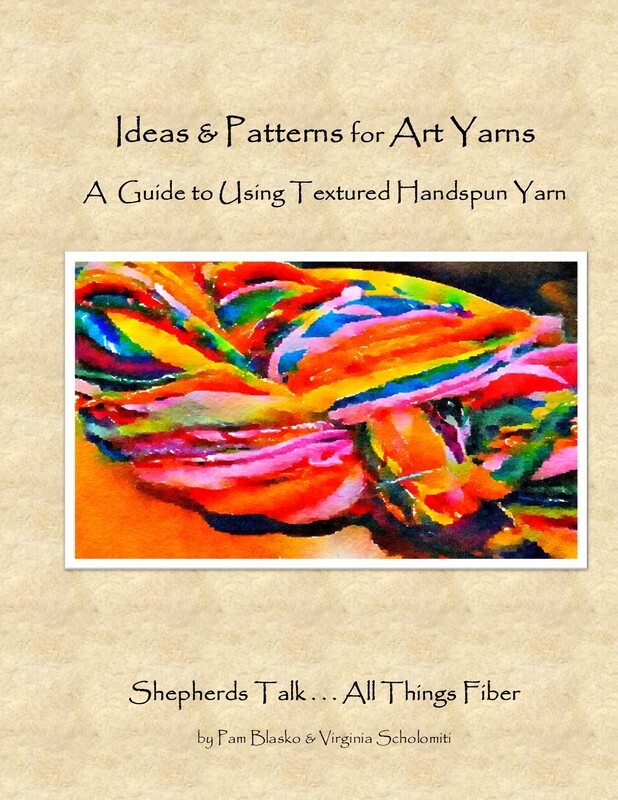 ​‘Ideas & Patterns for Art Yarns: A Guide to Using Textured Handspun Yarn’ is a collection of simple ideas inspired by beautiful handspun textured art yarn. You may spin these yarns yourself or purchase them from fiber artists. People are always asking us how we use the handspun art yarns that we spin. This collection of patterns and recipes will provide over 30 answers for you to explore. Created for all experience levels, these ideas call for simple knit or purl stitches and simple crochet. Inside you will find a special bonus page with a free offer from Shepherds Talk for a video and mini workshop. There are lots of places to jot down your creative thoughts and ideas as you browse through the pages and even a technique to add locks directly into your work for a ‘faux tail spun’ or shearling effect. All hand spun yarns are works of art, created by hand and totally unique to the spinner. Sometimes it can be daunting to decide what project to choose for these fabulous yarns. 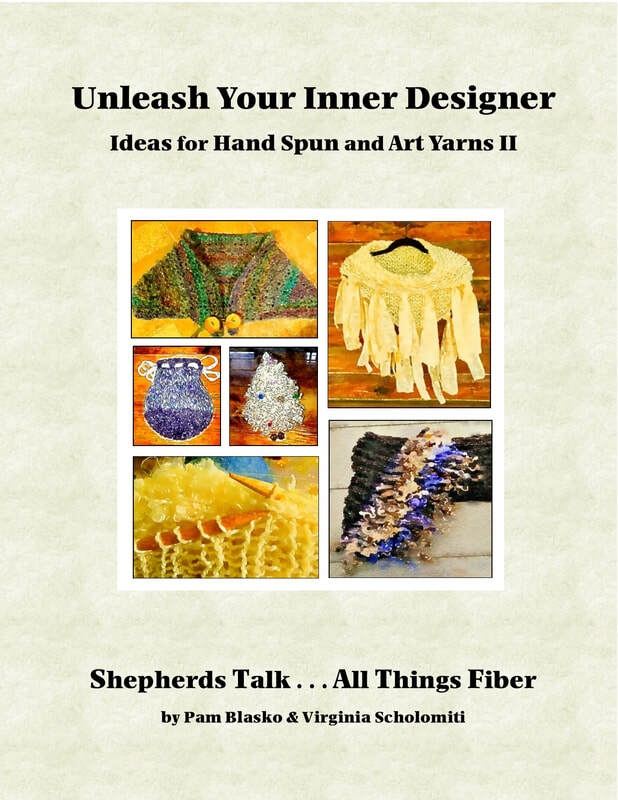 'Unleash Your Design Power' gives you over thirty ideas to highlight your favorite yarns. The combined background of these shepherds/fiber artists provide a wealth of creative ideas and patterns for you to draw from. You will find that becoming the 'designer' is not a bit intimidating. If you spin, knit, crochet, weave or felt, you are already designing. You simply may need a jumping off point to help decide how to use some of your creative yarns. These ideas and patterns were chosen to be virtually 'no fail'. They can be knit or crocheted in different types of textured and non-textured yarns, and easily accommodate various skill levels and tastes. You will find ways to stretch your precious hand spun and art yarns by using stitches that add in complimentary yarns, whether they are mill spun or hand spun from your stash. Ideas for working with unprocessed fiber, knitting locks directly into you piece, creating yarn without spinning, and other fun and interesting ideas will spark your imagination. Beautifully illustrated this book is bound to spark your love of creating with fiber.